This was the scene four weeks ago: Mom sitting on the eggs, dad patrolling the pond, hissing and snarling at everything and anybody he deems dangerous for his family. 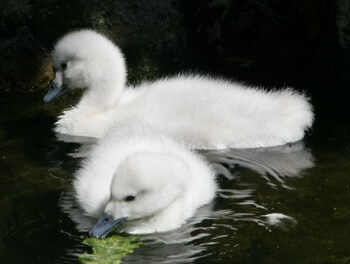 Yesterday the cygnets were already two weeks old and paddling around. Mom kept a watchful eye on them and dad patrolled the pond, hissing and snarling at everything and anybody he deemed dangerous for his family. 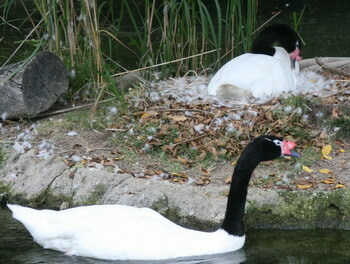 And what was happening behind the back of Cygne Père? 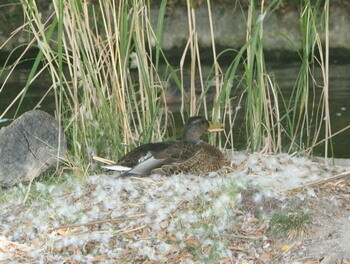 Someone sneaked in and test-sat in the nest. I assume that around bedtime there was some loud hissing and snarling to drive the pesky intruder away. My goodness, it is as if nature just came in my kitcen right now. I felt like I was there. Such well-taken pictures. Who took them? Where’s this pond? Well, I do like to take the odd photo now and then – all pictures in the blog are mine. The pond is right here in Los Angeles, at the Zoo. At present the cygnets are in hospital; one of them had an eye infection and the other one was taken to the sickbay as well, to keep his sibling company. Oh, I remember the pond now. I love the Los Angeles Zoo and do go there every once in a while.